We meet a multitude of people on a daily basis: the nice waitress in the coffee shop around the corner, the bus driver or the colleagues at the office. Without the ability to recognize faces at first glance we would not be able to distinguish between people. Monkeys also possess the remarkable ability to differentiate faces of group members and to extract the relevant information about the individual directly from the face. With the help of the so called Thatcher illusion, scientists of the Max Planck Institute for Biological Cybernetics in Tübingen, Germany, have examined how people and macaque monkeys recognize faces and process the information in the brain. They found out that both species perceive the faces of their kin immediately, while the faces of the other species are processed in a different way. "From an early age on we are accustomed to the faces of other humans: a long nose, the swing of the lips or the bushy eyebrows. We learn to recognize the small differences which contribute to an individual appearance", explains Christoph Dahl, researcher at the Max Planck Institute for Biological Cybernetics". It is similar in monkeys. They learn to recognize the features of their fellow monkeys (so called conspecifics) and can grasp the identity of every group member quickly. "However in humans, as well as in macaque monkeys, this principle only works with individuals of the same kind", says Dahl. Even though the recognition of conspecific faces is achieved by means of holistic processing, the separate parts such as mouth, nose and eyes as well as the facial proportions are still important. "Although we look at the eyes first our neural functions still grasp the whole picture", Christoph Dahl describes the processing mechanisms behind the facial recognition. 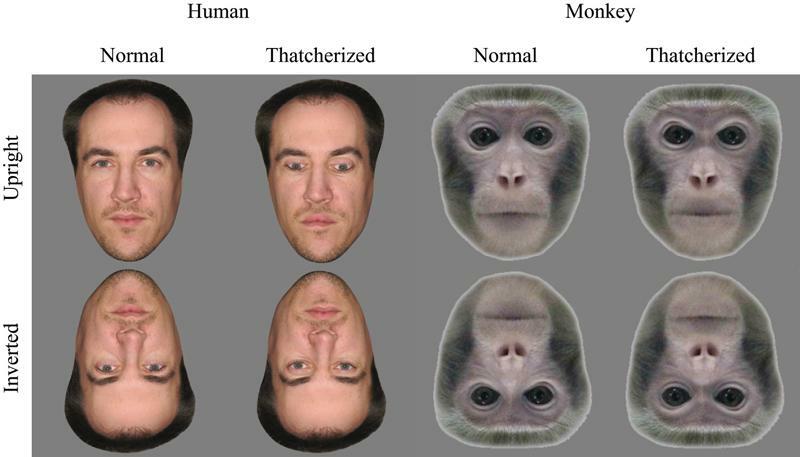 With the help of the "Thatcher illusion" the scientists examined the facial recognition of macaque monkeys and humans. Local changes in facial features are hardly noticeable when the whole face is upside down, but strikingly grotesque when the face is right side up. "The faces in which the eyes and the mouth were rotated 180 degrees look grotesque - but only if we see them the right side up. Upside-down the differences between a normal face and a ‘thacherized’ face are hardly recognizable", explains Christian Wallraven, one of the scientists involved in the study. The effect can be explained by the lack of processing capabilities for locally rotated facial features when the face is turned upside down. The holistic processing mechanisms allow us to recognize fine changes in the arrangement of the separate facial parts. If the whole face is rotated 180 degrees, this ability gets lost. The usual recognition mechanisms do not function with either inverted faces or with the faces of foreign species. The scientists discovered that the Thatcher illusion in macaque monkeys only works for the faces of their conspecifics, while they paid no special attention to the extremely grotesque human faces. Vice versa it behaved the same with humans for whom the manipulated monkey faces remained inconspicuous. "It must have been of great advantage for us as well as for our next relatives, the monkeys, in the course of the evolution to recognize especially the faces of our kind and also to develop similar processing mechanisms." Wallraven sums up. Besides, the ability to recognize faces on the first sight, the holistic processing opens another possibility: the identification of different conspecifics with in no time.